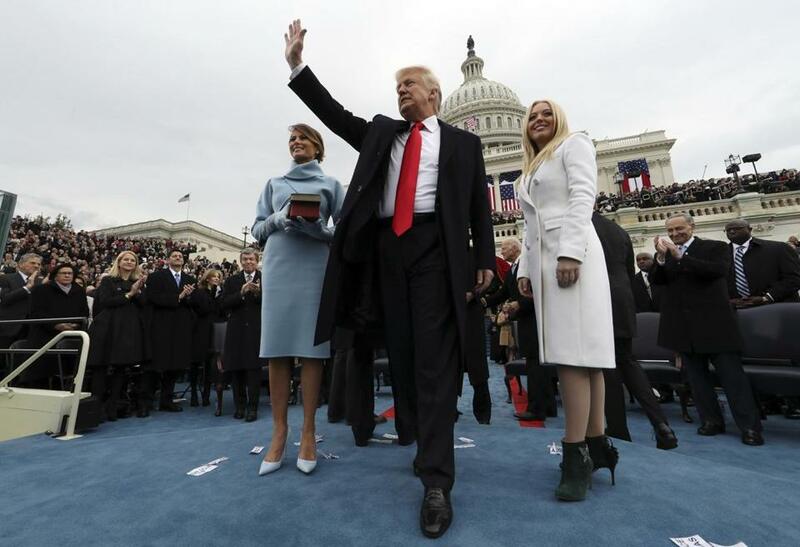 President Trump waved after taking the oath of office as his wife Melania held the Bible, and Tiffany Trump looked out to the crowd. WASHINGTON — The Interior Department was ordered Friday to shut down its official Twitter accounts — indefinitely — after a National Park Service employee shared two tweets that noted President Trump’s relatively small inaugural crowds compared to the numbers former President Obama drew in 2009. ‘‘All bureaus and the department have been directed by incoming administration to shut down Twitter platforms immediately until further notice,’’ said an e-mail circulated to Park Service employees Friday afternoon. Interior has dozens of official Twitter accounts at its multiple offices and 10 bureaus, which include the Park Service, US Fish and Wildlife Service, and US Geological Survey. As Trump’s inauguration ceremony got underway Friday, a Park Service employee involved in social media officially retweeted a tweet from New York Times reporter Binyamin Appelbaum (@BCAppelbaum) that pictured the crowd at Obama’s inauguration next to Friday’s gathering on the Mall. ‘‘Compare the crowds: 2009 inauguration at left, 2017 inauguration at right,’’ Appelbaum wrote. The Park Service Twitter account then shared a second tweet from someone else with a similar message. ‘‘They were not reflective of Park Service policy,’’ said the official, who requested anonymity because of the sensitive nature of the directive. The stand-down was ‘‘precautionary’’ until the agency completes a review of its Twitter accounts, the official said. The Park Service tweeting ban was first reported by Gizmodo.com. A retweet is a sharing of another person’s tweet. Seen straightforwardly, it’s a way to share an interesting piece of information. In the government’s case, the agency doing the retweeting must have a policy that agrees with the information. In this case, the Park Service didn’t. Or someone was nervous that the retweets would be seen as endorsements of a relatively low crowd estimate and rankle the new administration. It was unclear who at Interior made the decision to ban tweeting for now. The agency is being led temporarily by a team of career civil servants while the Senate considers Representative Ryan Zinke, Republican of Montana, as Trump’s nominee for secretary. It was unclear Friday if the retweeting Park Service employee had been identified. But the offending shares from @NatlParkService had been removed from the agency’s Twitter feed. ‘‘Due to the difficulty in accurately assessing crowd estimates for large events, most notably following 1995’s Million Man March, the National Park Service no longer makes it a practice to provide crowd estimates for permitted events,’’ Crosson said in an e-mail.